A Cosmic Ray is an energetic particle that was accelerated to near light speed during the violent catastrophic death of a star. These particles travel through the vastness of space for millions of years until they reach our earth’s atmosphere 30km above the Earth’s surface. These particles fill the universe and come from a variety of sources including our own Sun but most come from distant events like exploding supernova and yet unknown happenings in the outer-most reaches of space and time. Although commonly called a cosmic ray the term “ray” is a misnomer, as cosmic particles arrive individually as a primary particle, not as a ray or beams of particles. 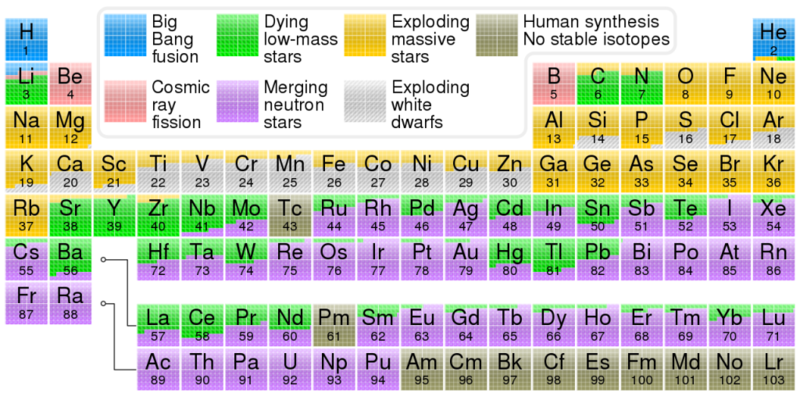 90% are Protons, 9% helium nuclei, and the remainder electrons and positrons. When these primary particles hit, they do so with such tremendous energy they rip their way into our atmosphere with atom-smashing power. 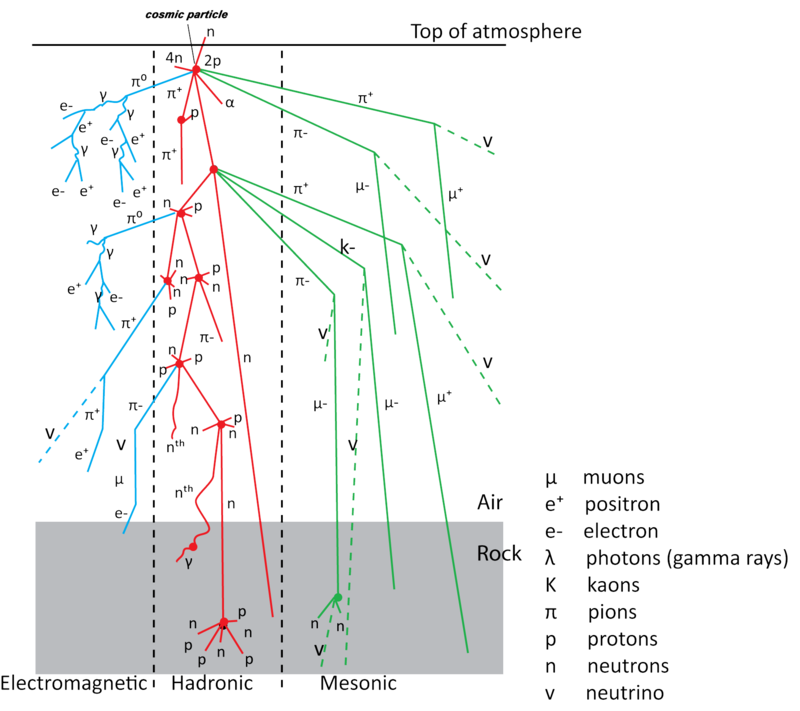 Cosmic rays are commonly known to have energies well over 10 x 21 eV (electron volts), far more than any particle accelerator built here on earth, like the Large Hadron Collider. These interactions produce an exotic zoo of high energy particles and anti-matter particles, high in the earth’s atmosphere such as positive and negative pions and kaons that subsequently decay into muons and muon-neutrinos. Pions decay to become the starting points of large cascades of electrons, positrons and gamma rays. 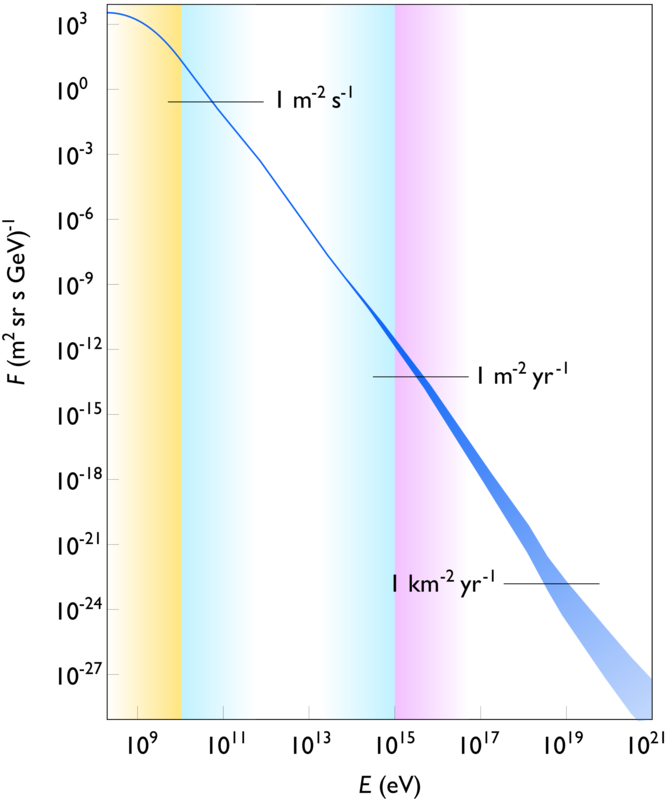 The resulting flux of particles at ground level consists mainly of muons and electrons/positrons in the ratio of roughly 75:25 with energies greater than 4GeV travelling at near the speed of light ~0.998c. When a Co­smic particle enters the earth’s atmosphere it is not uncommon for them to collide with atoms in the atmosphere. 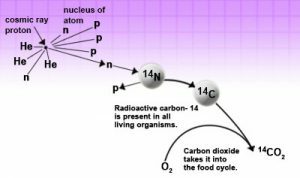 These interactions go on to create energetic neutrons that collide with nitrogen atoms a nitrogen-14 (seven protons, seven neutrons) atom turns into a carbon-14 atom (six protons, eight neutrons) and a hydrogen atom (one proton, zero neutrons). Carbon-14 is radioactive, with a half-life of about 5,700 years and is used in carbon dating. 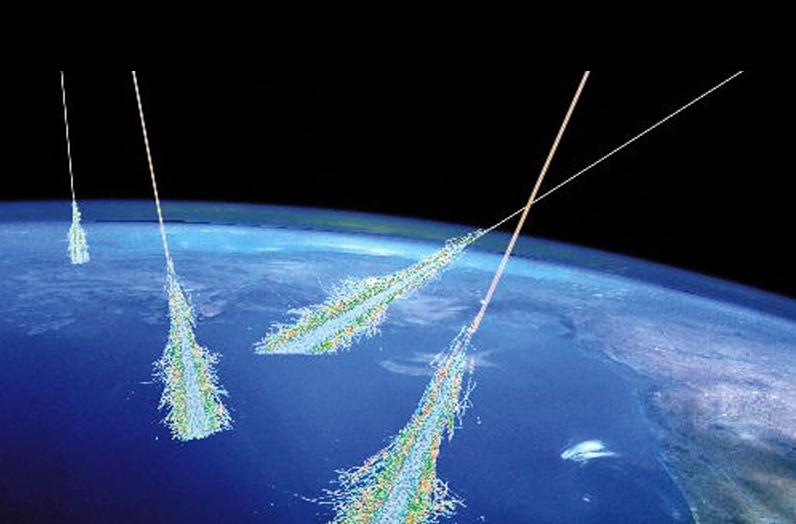 Muons created by the interaction of cosmic rays and our atmosphere lose their energy gradually. Muons start with high energies and therefore have the capacity to ionise many atoms before their energy is exhausted. However, as muons have little mass and travel at nearly the speed of light, they do not interact efficiently with other matter. This means they can travel through substantial distances through matter before being stopped. Consequently, muons are raining down and passing through just about everything. They can penetrate mountains, buildings, our bodies, and deep into the Earth’s surface, without anyone really being aware of their existence. Yet this radiation has been present throughout the entire evolutionary history of life on our earth. Muons created by the interaction of cosmic rays are an everyday demonstration of Einstein’s theory of relativity. A muon has a measured mean lifetime of 2.2 microseconds. Consequently, they should only be able to travel a distance of 660 metres even at near the speed of light and so should not be capable of reaching the ground. However, Einstein’s theory of relativity tells us that time ticks slowly when moving at speeds close to that of light. Whilst the mean lifetime of the muon at rest is only a few microseconds. But when it moves at near the speed of light its lifetime is increased by a factor of ten or more giving them plenty of time to reach the ground. Error: Error validating access token: Session has expired on Wednesday, 23-Jan-19 16:38:21 PST. The current time is Saturday, 20-Apr-19 13:42:08 PDT.